Never suffer from the dreaded low battery again. 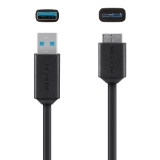 Belkin mobile chargers and cable are designed to charge the greatest number of devices on market, making them the only chargers and cables you'll ever need. The sleek, compact design is not only easy on the eyes, but you can plug it in virtually anywhere, so a quick sync or battery boost is always in reach whenever you need it. 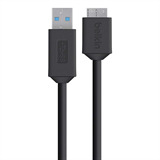 The Belkin USB 3.0 Micro-B Cable provides 5 Gbps transfer speeds, up to 10X faster than USB 2.0. SuperSpeed USB 3.0 also offers faster device charging than USB 2.0. Galaxy smartphones and tablets with USB 3.0 support up to 2X faster data transfer so you can sync your photos, music and data at blazing fast speed. The cable is also backwards compatible with USB 2.0. At 0.9m/3ft, the cable is the perfect length to be used anywhere -- plug it into your laptop for the fastest data transfer, use your own car charger to charge on the go, or wall charger to charge anywhere at home. Great as a replacement cable or if you simply need an extra. Compatible with most tablets and smartphones with a USB Micro-B 3.0 port. Every time you plug in your smartphone or tablet using a Belkin cable, you can be sure you're plugging into quality. The Belkin Micro-B to USB 3.0 cable can fit into even the tightest areas, thanks to the softer polymer design and Tactilite™ molded-strain relief that keeps your cable from weakening or fraying. The grounded indents, inner foil shield and stainless steel shell at both connectors are designed to deliver consistent top performance levels. We're serious about quality. That's why our quality teams go above and beyond for consumer and environmental safety, setting standards above the minimum requirements and putting each product through our own set of rigorous quality assurance tests.